Our football team form guide looks at the best form teams in England and Europe. The idea of this article is to pick out the top teams in form with good fixtures and teams out of form with tricky fixtures to help you build your midweek or weekend accumulator. We will also look at teams in form who might have tough matches and you might want to avoid putting them in your accumulators. We will usually focus on the major European Leagues, English football leagues and continental competitions. One thing to note is this article purely looks at form and if you’re after more detail on each match then check out our football match previews. Charlton Athletic – League One promotion hopefuls Charlton Athletic put their superb home record to the test this weekend against mid-table Southend United at The Valley. The Addicks have won 4 of their last 5 league matches in front of their own supporters, and the only points they dropped during that hugely positive sequence was in a 1-1 draw against in-form Sunderland. With 4 defeats in their last 5, a Southend side short on confidence should be relatively easy pickings for Charlton on Saturday, and the Addicks look great value at 8/11 with bet365 to take maximum points. Carlisle United – In a crucial looking League Two play-off 6-pointer, 5th placed Carlisle United meet 7th placed Exeter City at Brunton Park on Saturday afternoon. Carlisle have been in electric form since mid-December, winning 8 of their 9 League Two fixtures in total, and 100% of their last 6 games at home, scoring 17 times in those half a dozen matches in the process. Exeter are in decent shape too, though it’s worth noting that the Grecians have won only 2 of their last 10 away from home. Carlisle would fancy their chances of beating anyone in League Two at present, and they are priced brilliantly at 7/5 with bet365 to deliver the goods again this week. Manchester City – Pep Guardiola’s Manchester City seem to have found another gear in recent weeks as they look to rein in and overtake Liverpool in the race to be crowned Premier League champions. 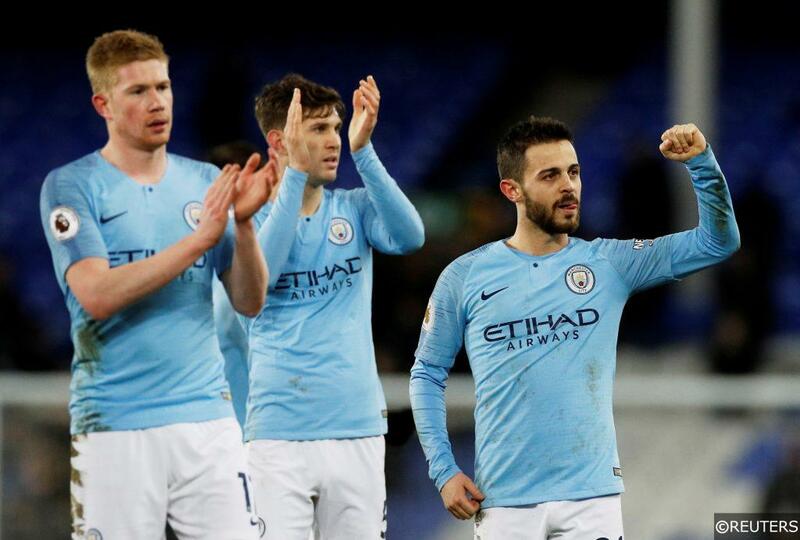 City have used their form at the Etihad this season as a springboard for what could possibly be a successful campaign on multiple fronts in 2018/19. The Citizens have won 15 of their 16 games on their own patch in all competitions this term. Chelsea are in the midst of a wobble and a crisis of confidence at present, with Maurizio Sarri’s tactical plan coming under increased amounts of scrutiny. In their current frame of mind, the Blues won’t be looking forward to their trip to the Etihad and City look a great bet at 4/9 with bet365 to send Chelsea packing. Borussia Monchengladbach – Gladbach have been impressing everyone in Germany this season in their pursuit of Champions League qualification. Die Fohlen’s home performances have been a particular highlight, and their recent 2-0 win at the Borussia-Park against Augsburg maintained Gladbach’s 100% Bundesliga record there this season. With 9 wins from 9 and Borussia Monchengladbach looking irresistible at home, we think the 4/6 odds available with bet365 on them continuing their hot-streak against Hertha Berlin look fantastic value. PAOK – A titanic Greek Super League tussle is on the horizon this weekend, as league leaders PAOK Salonika lock horns with 2nd placed Olympiakos at the Toumba Stadium. PAOK currently hold a 6-point advantage over their rivals, a lead largely built on the back of team’s sensational home form. PAOK have won all 10 of their home matches in the league this season, and they are priced at a generous looking 13/10 with bet365 to extend that phenomenal winning streak at Olympiakos’ expense on Sunday – a result that would complete a league double for PAOK over their fellow title contenders. Young Boys – Runaway Swiss Super League leaders Young Boys can put further distance between them and their challengers with a win at 3rd placed FC Thun this weekend. Young boys are a massive 19-points clear of Basel in 2nd place and FC Thun just behind them, and their unparalleled away performances have been a key driving force behind their relentless pursuit of glory. The Swiss champions have won 4 away games on the spin and 8 of their last 9 on the road in total. Young Boys have already beaten FC Thun twice this season, and at 3/4 with bet365, they are a cracking price to complete their hattrick. Categories: Betting Strategy and Football. League: England League 1, England League 2, and National League. Sports: Football.